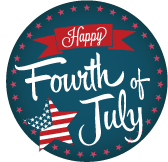 News from LMCU: We’re Closed 4th of July! We’re Closed 4th of July! In observance of Independence Day, LMCU branches will be closed for business on Tuesday, July 4. We will resume normal business hours on Wednesday, July 5.